Where not just your donations, even a smile counts! For every penny you donate, KANE will match 10%. We thank all the 41 families who donated generously to our donation box on Dec 19th. KANE President Mr. Babu Punnose handed over the fund check to Tamil Makkal Mandram President Mr. Karthikeyan Ramu during the Malhar Inauguration on Apr 23rd, 2016, to donate that to the "Tamilnadu Foundation", a charity group helping people affected by Chennai Flood. KANE CARE is KANE's Charity, Humanity & Awareness mission. Since our founding in 1970, we understand the importance of giving back to the community. When we help people, we are also gaining an understanding about each other and a sense of human compassion. We ran several campaigns for blood and organ donation in association with organizations like Be the Match etc. We send obituary emails and our condolences to bereaving families in our community. Our committee members visit their houses to show them we care for them and thereby take away the grief from such families who has recently lost a loved one. We remember visionary leaders, promote good causes(breast cancer awareness etc) and important occasions by doing our little part through our facebook page and newsletters. We are answering atleast one question per day via the online chat agent "K-Uncle" on KANE's website. There are many around the world benefited through this service. While we are committed to continue doing all the above, we thought to bring all our Charity, Humanity and Awareness work under one umberalla and to call it "KANE CARE". We request your support and help in making this project a success and to help those in need. As it says in the tagline of KANE CARE, "Together we bring smile", join us to make a difference. Each of our individual contributions is magnified when we all join together. We sincerely thank you for your support. We accept kind and generous donations using KANE CARE Donation box available at our Front Desk. We setup dropbox for you to donate non-perishable foods and toys. We are working with some charity organizations and other social service agencies to partner with them in creating awareness among our people. We will run health surveys, blood camps and other organ donation campaigns free of cost. We are working with health institutions to setup free health seminars and medical camp for our community. When you join us for our next event, please donate cash(even $1 counts) or check into the donation box at the front desk. Our "Give Back to the Community" campaign dropbox is available during our Christmas celebration. Please bring non-perishable food items and gently used toys to donate. When you get e-mails from us or see our facebook post for blood required or organ donation campaign- Please share the news and step up if you could donate. As part of our Christmas celebrations on Dec 19th, we conducted a campaign "Give back to the community". 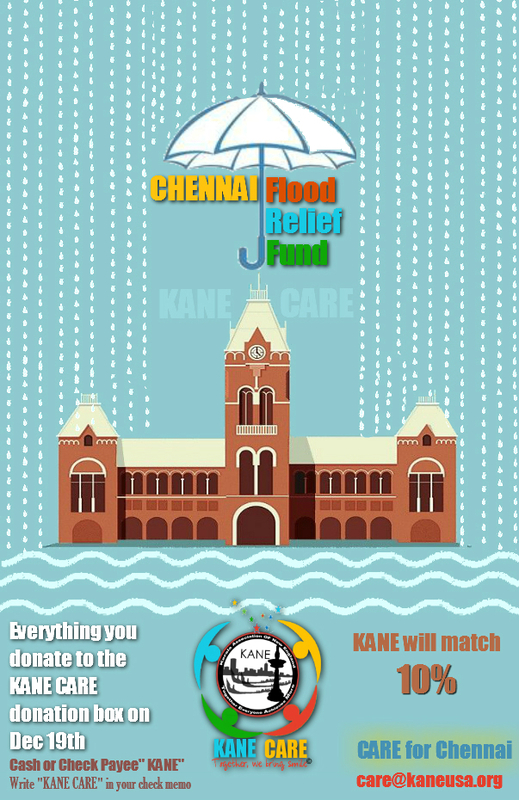 We have decided to run our first campaign for "Chennai Flood Relief Fund". More than 40 families contributed to the fund. We thank KANE ex-president Mr. Joboy Jacob for doing the Inaugural donation for Chennai Flood Relief Fund. Thanks to all who helped us building this fund.